For the cost, this was really great. I was very pleased. I also washed it on delicate and it was fine. This should look great when I dress as Winnie Sanderson this Halloween! It fit well and looked quite pricey....It's going to last and it's machine washable!! The overall design is just marvelous, and it fits very well. 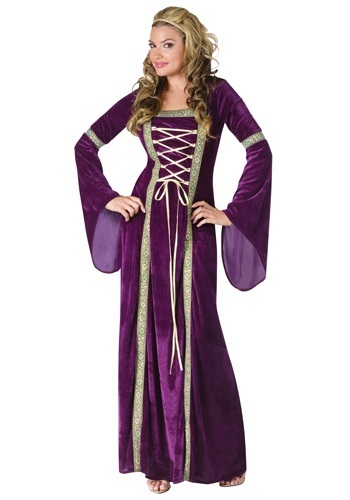 It's brilliantly made, and perfect for any Halloween Party or Renaissance Festival. My personal favorite attribute is the long sleeves; they add a simple, yet regal touch to the whole thing. That's what my daughter said as my granddaughter spied me in this. Her eyes shinned and she couldn't stop smiling! It is very pretty and in my budget. I am short, 5"2 so this in a medium large is a bit long but I figure for my first Renfair costume I can hold it up and imitate the ladies of that time period.